The project aiming to restore Mont-Saint-Michel's maritime character has given added value to the walk between the mainland and the town. An all-new experience awaits visitors. 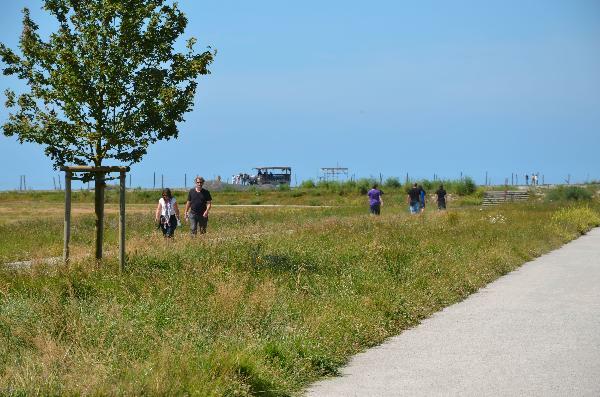 Starting from the parking area, several paths can be taken to make the most of the site's landscapes and of an all-new view of Mont-Saint-Michel. It takes about 50 minutes to walk from the shuttle bus stop to Mont-Saint-Michel. All three paths first lead to the Dam (place du Barrage), before heading on to the new walkway that takes you to the Rock. This path, called "La Lisière", offers an incredible view of the Mount. You can walk along a well-kept and tree-lined pedestrian path, accessible to all. The "Western" path takes you to the Mount via the Couesnon river banks. This path will first take you to the Mont-Saint-Michel Dam, one of the main focus points associated with the restoration of the site's maritime character, due to its hydraulic nature and architecture. - The central path: "Mont-Saint-Michel"
This path will lead you through the Mont-Saint-Michel hamlet (previously the Caserne), where you can find restaurants, hotels and a supermarket.